ICT (by which I mean digital technology) is at some point going to become an essential element of education for school age learners – reflecting the ways in which ICT is changing the nature of disciplines outside school and the new ways of supporting learners and changes in pedagogy that it enables. However, finding the funding to ensure adequate up-to-date provision of ICT in schools is a significant challenge. Bring Your Own (BYO) approaches potentially offer a sustainable model of ICT provision in schools, whilst bringing with them a range of pragmatic, pedagogical and ethical challenges. Mal Lee and Martin Levins wrote one of the first books on the subject of Bring Your Own strategies in schools (Lee & Levins 2012), in which they introduced the term Bring Your Own Technology (BYOT). 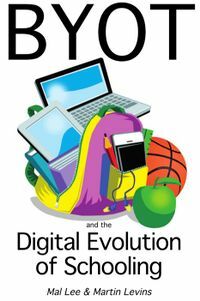 BYOT, they argued, differed from the more familiar term Bring Your Own Device (BYOD) in that it involved a shift in power from the school to the home. Their latest book takes another look at BYOT and how it has been implemented in a number of leading schools (what they call Pathfinders). In this new book they argue that schools that have normalised the use of digital technology progress through a series of evolutionary stages. A move to a BYOT approach forms a critical element within this progression. Lee and Levins emphasise a number of features of BYOT, which align with previous work, perhaps most importantly including the importance of trust (Twining 2010) and that the major challenges are people problems rather than technological ones (Twining et al 2006). If you are interested in BYO or ICT strategies in schools more generally then this book contains important insights and useful advice. This book was previously published on a CC BY 4.0 licence - which allowed users to distribute, remix and build upon a work, and create Derivative Works – even for commercial use – provided they credit the original creator/s (and any other nominated parties). Lee, M. & Levins, M. (2012) BYOT: a guide to introducing a ‘bring your own technology’ model. Melbourne: ACER Press. This page was last modified on 30 March 2017, at 08:39.